Back when I was in the Army the last thing it was known for was good food. Army food was a bad joke. From my basic training at Ft. Ord, California (1969), to my tour of duty in Vietnam (1970), the food was crap. No other way to put it. It seemed like our government didn't think "good food" was a priority back then. 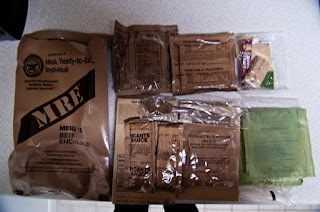 I certainly wasn't a fan of our MREs (Meals, Ready-to-Eat). Interestingly enough, I did like some of the WWII rations that still made the rounds like Beans & Franks. Put some McILHENNY's Tabasco sauce on them, and I was a happy guy. The US Army Institute of Environmental Medicine is currently investigating how military food rations affect gut health. That's got to be a first! The Institute is actively recruiting volunteers for a 21-day study to determine if there's enough good gut bacteria in the military diet. And get this, Army dietitians have even devised a cookbook that utilizes MRE foods! Hard to believe. Forgive my skepticism, but until I try these new MREs (which frankly isn't likely) I'll reserve judgement on how good they taste.